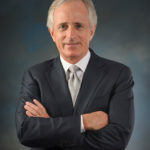 Robert Corker is an American businessman and politician serving as the junior United States Senator from Tennessee since 2007. He is the current chairman of the Senate’s Committee on Foreign Relations (115th Congress). He is a member of the Republican Party. In 1978, Corker founded a construction company, which he sold in 1990. He ran in the 1994 U.S. Senate election in Tennessee, but was defeated in the Republican primary by future Senate Majority Leader Bill Frist. Appointed by Governor Don Sundquist, Corker served as Commissioner of Finance and Administration for the State of Tennessee from 1995–96. "It is not really our country so much is the problem, it’s sort of the parasitic relationship that Canada, and France, and other countries have towards us." "My dad just imprinted in my mind from a very young age that you always do what you say you’re gonna do when you say you’re gonna do it."